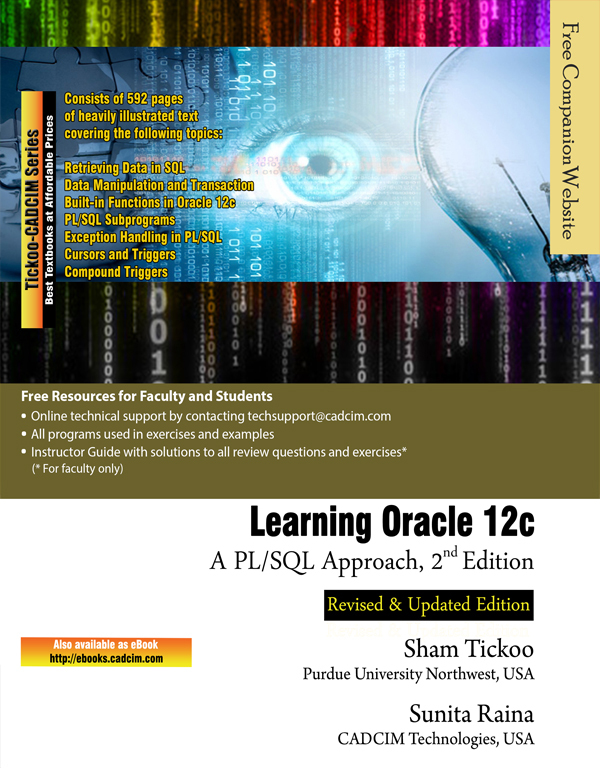 Learning Oracle 12c: A PL/SQL Approach is an example-based textbook written to cater to the needs of the students and the professional developers who want to develop database management applications using Oracle SQL and PL/SQL. The chapters in this textbook are structured in a pedagogical sequence, which makes the learning process very simple and effective for both the novice as well as the advanced users of Oracle. In addition, the book follows the PL/SQL approach that will help you develop database applications with improved performance. A wide range of features of SQL and PL/SQL such as data manipulation and transaction, built-in functions, exception handling in PL/SQL, cursors and triggers, subprograms, and so on have been covered in the textbook that will enable the readers to take full advantage of this cutting-edge technology. 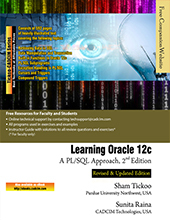 It is a comprehensive textbook with rich information about Oracle and is written in an easy to- read format supported by hints and illustrations. The highlight of the textbook is that each concept introduced in it is explained with the help of suitable examples to clarify concepts and facilitate better understanding. The simple and lucid language used in the textbook makes it a ready reference for both the beginners and the intermediate users. Consists of 12 chapters which introduce the key ideas of the Oracle SQL and PL/SQL in an innovative way. The concepts are illustrated through best programming examples, covering the basic as well as advanced concepts of Oracle. Each concept introduced has been explained with the help of examples, thus making it an ideal guide for the beginners as well as experienced users. Additional information is provided throughout the book in the form of tips and notes. If you find any problems in downloading the files or the contents, please contact us at techsupport@cadcim.com. Thank you.